Scientists have found cannabinoid receptor-like proteins in nematodes and sea squirts, an indication that the endocannabinoid system began evolving about 600 million years ago. Sea Squirts are members of the animal phylum Chordata and during their larval stage, they possess a notochord or a very basic, semi-rigid spinal chord and a primitive brain structure. This enables the free swimming larvae to move its "tail" swim around in search of a new home. So even the creatures with the most primitive nervous systems on Earth have what appear to be cannabinoid receptor-like proteins, indicating that cannabinoid compounds must be pretty essential in the most basic aspects of vertebrate brain and nerve functions. 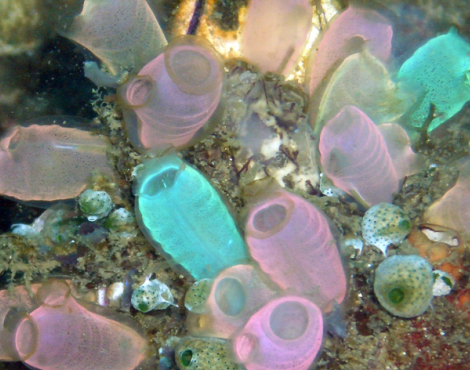 It is interesting to note that once the Sea Squirt locates a suitable rock or other surface on which to attach its holdfast, its little brain and spine are no longer used or needed and they just atrophy from disuse. From this point on, the creature's days of freely swimming around in the ocean are over and it spends the rest of its life simply taking in the material in its immediate surroundings, filtering out detritus (decomposing plant and animal matter as well as feces), swallowing it and spewing whatever is left back out into its environment. How like the humble Sea Squirt are some humans. In their youth, they ramble about seeking new experiences, ideas and discoveries, but with age they settle in to a comfortable spot and are content to take in and spew forth whatever detritus of ideas happen to be floating around the ideological rocks to which they have attached themselves. No longer using their brains to think original thoughts, or their spines to resist erroneous, conformist dogmas and assumptions, theirs is but to holdfast to a brainless, spineless existence that sways with the changing currents of the media outlets to whom they outsourced their thinking years ago. This is the big reason why we don't have totally free access to whole plant medicines and the world is deprived of the whole range of beneficial products (food, fuel, fiber, building materials, paper, lubricants, etc.) of agricultural/industrial hemp.